HELP! My Computer Is Very Slow, It Used to be Fast! What Happened? Help!...my computer used to be fast when I first got it, now it is very slow... What happened? I get this at least once a day from someone who asks me what I do for a living. It is the same story, same situation, and same result. A slow computer ... that once used to be fast!! Well, Now I will attempt to explain what could be causing this slowness and how it can be avoided and cleaned up. This is by far the biggest problem that computer users face when talking to just about everyone who uses a computer. One thing we need to consider is that just like cars, computers need a tune up. They have a habit of degrading over time. I am not necessarily talking about the hardware; I am talking about Microsoft Windows and all the other programs that have been loaded on the machine over the years. These include programs that you intentionally loaded but also include programs that didn't intentionally load. They just found a way to get onto your computer. I am not simply talking about computer viruses. I am talking about other programs that for example attach themselves to your Internet Explorer toolbar, spyware, malware and any other programs that load into your startup simply because you didn't uncheck that "checkbox" on that webpage you were surfing. So far does this sound like you? TIP #1: INCREASE THE MEMORY. Well, let's go back to when you first purchased the computer. It was brand new machine with a brand new operating system (Microsoft Windows). The first thing the salesperson didn't tell you were about something called RAM. Lets discuss what RAM actually is. RAM is a form of computer data storage. Today, it takes the form of integrated circuits that allow stored data to be accessed in any order (i.e., at random). The randomization causes that any piece of data can be returned in a constant time, regardless of its physical location and whether or not it is related to the previous piece of data and is very fast. So when you first bought the computer, the computer had a certain amount of RAM. The computer most likely was sold to you with the minimum amount of RAM required by Windows to run properly. This worked great if you plan on using your computer as a giant paperweight and don't do anything on it. In this scenario, you have no additional software on the computer. You just have Windows on it all by itself. You also haven't visited many website and haven't yet inadvertently installed any toolbars, spyware, anti-virus software...etc. But here is the good news. Memory these days is very cheap and you can simply increase it by buying more from the manufacturer of where you bought the computer. Computers normally don't come with this much RAM unless you specifically order it with extra RAM memory. A screen will pop up. 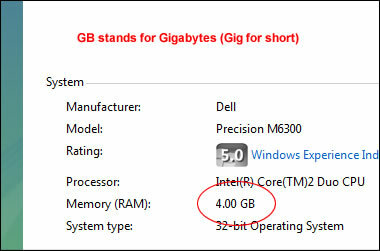 Look for the section that says "Memory (RAM)" or if you are running Windows XP GB of RAM. This will tell you based on the operating system if you need more memory. You should contact the store/vendor where you bought the computer, provide them with the exact model and ask for the same exact memory type that came with it. Computers manufactured by companies like DELL have a "Service Tag" and "Express Service Code" that you use when you call them. They will know exact what kind of memory that you will need for your system. Then, you will need to install it once you get the memory. If you need it installed you can contact us for availability. Once the RAM is installed and working, you will probably notice an immediate speed increase on your computer! 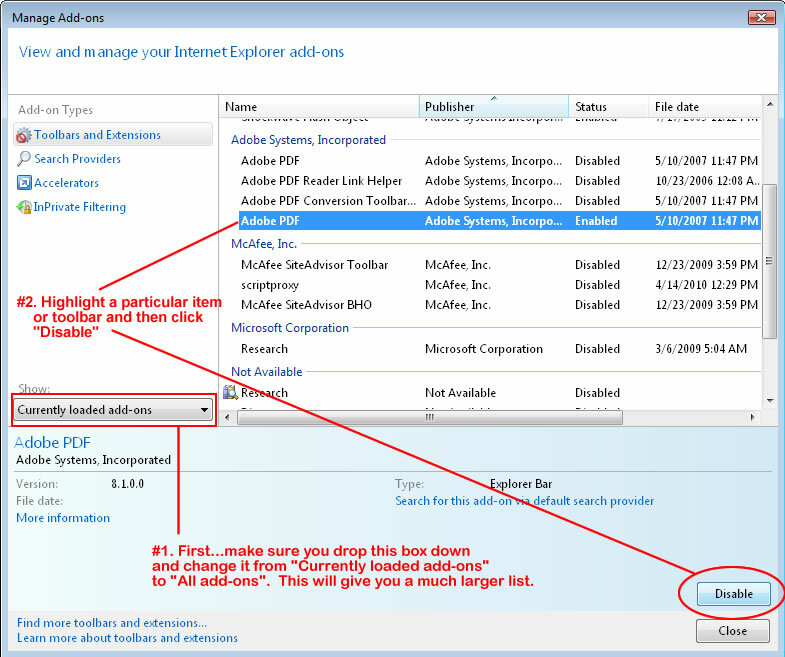 TIP #2: CLEAN UP THE BROWSER TOOLBAR. Remember when I said that you naturally install stuff on your computer over the years even if you didn't want to? Well, it is true! The longer you have been using your computer, the more *stuff* has found its way on to your computer. One major cause of this is the entire web surfing/browsing that you have done over time. One of the things that major websites like Google, Yahoo, Bing and others like to do it install browser toolbars. NOTICE ALL THESE TOOLBARS! IT IS A COMPLETE MESS! Any reason how this happened? Well, it doesn't really matter anyway, we just need to clean these up. To disable all these toolbars click on "Tools" -> "Manage Add-ons"
Once you do this then click on a particular item and click "Disable". 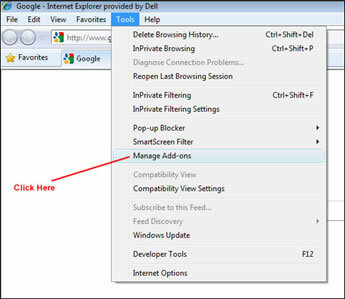 You may need to do this multiple times to disable all the extra toolbars that were installed on your system. You can do this in the same session by scrolling down in the window on the right and disabling each item listed. Once you are complete, close out of the window, close all browser windows and re-open them. Next time you re-open your browser, it should be a lot cleaner. TIP #3: GET AND RUN A TRUSTED ANTI-VIRUS PROGRAM. It is possible that the problems you are experiencing may be a lot deeper than a lack of computer memory (RAM) and excessive toolbars. Perhaps somewhere along the way you may have gotten a computer virus. If your computer runs slowly but yet still runs, the first thing you may want to do is get a portable backup USB hard drive. You can get these at any Staples or Best Buy. They are inexpensive and hold a lot of information. You will want to copy all your important files from you main disk to this backup. If you are not sure about this then contact a computer technician to help you located them or back up EVERYTHING. Then we can install and run a virus scan program such as McAfee Antivirus software or Norton Anti-Virus software. If you have it already and run it, then see what it finds. If you notice that it is finding a LOT of viruses on your computer, virus software may or may not clean them all up. If it does clean it up and your computer is still slow, the virus may have caused enough damage to where you want to re-format the hard drive and re-install your operating system. Again ... anti-virus software consume some memory (RAM) so having that extra memory from Tip #1 would be the ideal first step. PLEASE NOTE: Do *NOT* do this unless you have sufficient experience in this area. You will need all software disks that initially came with the computer. You will also need to have done a COMPLETE FULL backup of your important files. These files can include family photos, business contacts in Outlook, QuickBooks accounting data, other 3rd party software, videos, sounds, resumes, portfolios, etc... Now if your anti-virus software only found one or 2 viruses and cleaned it up, then you may be alright. TIP #4: CHECK THE HARD DISK SPACE. Another thing you want to check is the hard disk space. Hard disk space is storage space. This is where all your programs, photos, videos, etc go. Do not get this confused with memory. Memory is a temporary holding space for your programs. Memory allows the computer to access these at a much, much faster speed and it is important to have enough memory to run these programs at the same time (or run large word processing programs). 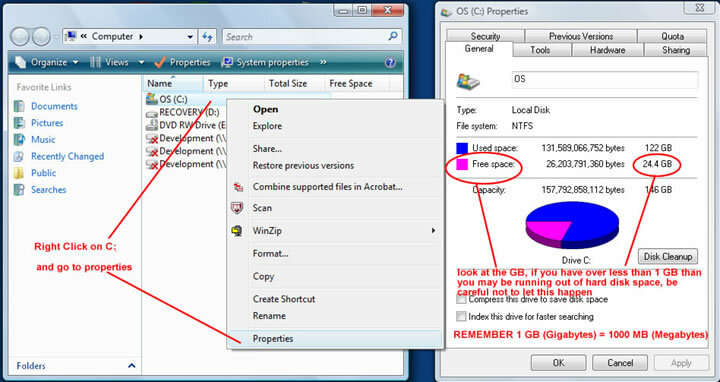 To check your hard-disk space, double-click on the computer icon on your desktop then right-click on "C:" and go to properties. (Or click "Start" highlight "Computer", highlight "C:" right-click and go to "Properties"). Also you can save hard disk space by cleaning you hard drive from hidden files. This article will help to free up space and increase the computer speed as well. Check to make sure you have at least 1GB remaining. If not, then take note but if you start falling under 200MB of storage that means you are running out of space and it is either time to copy files off the computer, clean up hidden files or get an additional hard drive. This is where you will need some maintenance done. TIP #5: DEFRAGMENT THE HARD DISK. As you continuously use your computer by adding, removing, modifying and changing files, your hard disk will become fragmented. Fragmentation occurs when the file system cannot or will not allocate enough continuous space to store a complete file as a unit, but instead puts parts of it in gaps on the hard drive. Larger files and a bigger quantity of files also play a role to fragmentation and performance loss. So when the disk goes to read the file, it actually takes longer to load because the file is not stored in the same spot on the hard drive. It is like having to fast forward and rewind a VHS tape just to get one continuous video. Things are no longer in order. Well luckily in computers, there is a program called "Disk Defragmenter". To run this program click the "Start" button, type "defrag" in the "run box" and press "Enter". 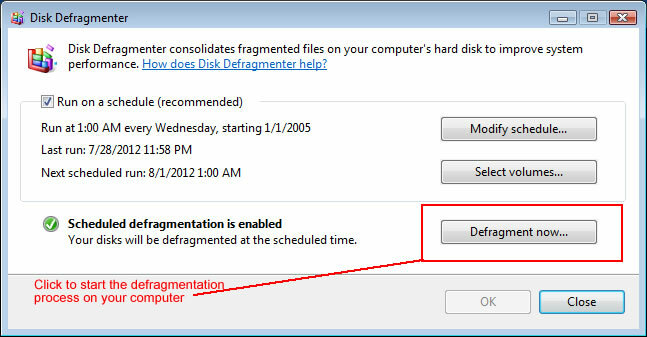 All you have to do is press the "Defragment Now", select the "Hard Drives" and press "OK". It may take a while to complete but it will do a good job at putting the storage of your files back in order and most certainly speed up your computer. Now, if you have done all the above and your computer still runs slow, you may need to re-install Windows operating system on it. Over time things are downloaded and if you got some spyware/malware that even an anti-virus program can't fix, this will be the only option. It is important to take inventory of the CD's/DVD's that come with the PC. Just absolutely make sure you backup your important files first. Also, please visit this article (that may seem counter intuitive) regarding downside of automatic windows update. It is also important find out how you can re-install Windows in case something happens. A new install of Windows is like a fresh brand new car engine, it will make your computer fresh and happy!!! Well I hope that it helped! If you need further assistance, please contact us for prices and availability.